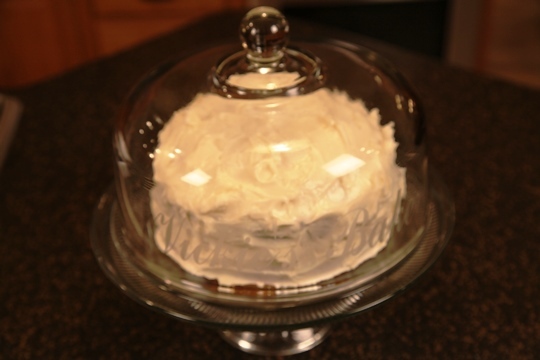 Whip up Vickies EASY Cream Cheese Icing for your next cake! This is the perfect cream cheese icing! It’s the recipe my Mom used to make. She used it on her Red Velvet Cake, on pumpkin bread, chocolate cupcakes and more. 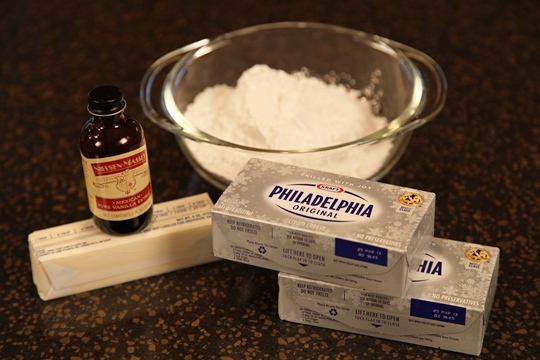 Be sure to use the Philadelphia Cream Cheese – regular, not fat-free. This is important. Some things can’t be skimped on and this is one of them in my opinion. The cream cheese should be cold. If there is any liquid in the package, drain it off. The butter should be softened and at room temperature. Beat the butter with a mixer until it is super soft. 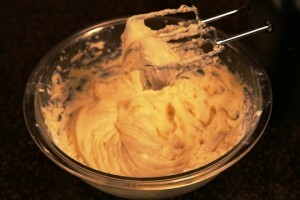 if you don’t beat it until it is creamy, you will have bits of butter clumps in your icing and you don’t want that. Add the cream cheese and beat until combined – but don’t over beat. Less is best. Cream cheese will release liquid the more you beat it and the icing will be too runny. Only FOUR ingredients make up this wonderfully creamy icing. In a medium bowl, beat the butter with a mixer until creamy. Add the cream cheese and beat until combined. Mix in the powdered sugar and vanilla. 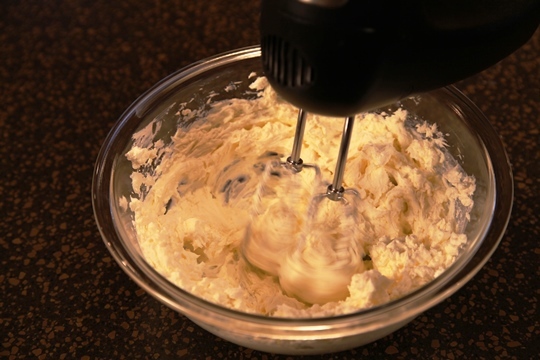 Now you should have a perfectly spreadable cream cheese icing. Use to frost your cake or cupcakes. 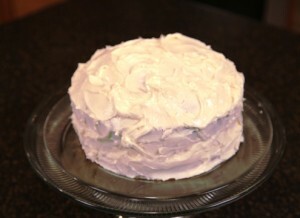 One final note: If you have happened to over beat the icing and it is too thin or runny, just pop it in the fridge for 30 minutes or so and it should firm up again. 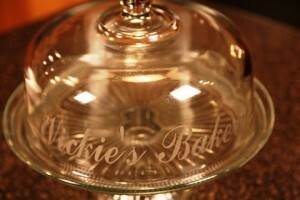 I wanted to show you my personalized cake plate that I absolutely LOVE! This is etched glass and as you can see it says,” Vickie’s Bakery” If you would be interested in ordering one for yourself, just email me at MakeLifeSpecial@gmail.com and I’ll be happy to send you the information. These can be personalized with any name.